Ferdinand Parpan has become a highly celebrated European sculptor, and this work “Femme” from 1964 is a typically beautiful example of his uniquely stylized figuration. Having attended the Place des Voges in the 1920’s, Parpan started working as an engraver, but in the 1930’s inspired by the Art Deco sculptor Dardé, he began carving in wood, and stone. He soon had his first exhibition on Avenue Victor-Hugo in 1936, and was encouraged by the sale of several pieces. But his progress was interrupted when he was called up to fight in the war. Resuming his passion after the Liberation in 1944, Parpan took a studio in rue du Retrait in Paris with the sculptor Louis Roy. 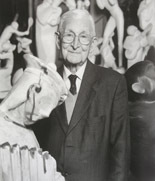 Whilst undertaking several public commissions to replace works that had been destroyed during the war, he became intrigued by the aesthetics of religious art and the veneration it evoked, and decided to adapt certain aspects into his own work to parallel the Modernist reverence of purity of form. This development defined the future of his oeuvre and received universal acclaim. It is this characteristic elegance and refinement of form that so successfully defines this magnificent work “Femme”. From 1947 Parpan exhibited widely in the Paris salons such as the Salon des Indépendants, Salon d’Automne, Salon de la Jeune Sculpture, Salon d’Asnieres, Salon de L’Art Libre, Salon des Artistes Francais. In 1950 he was appointed chairman of Salon des Indépendants. That same year, a major solo exhibition of his work was held at the Grande Galerie, on rue Faubourg Saint-Honoré, which firmly established his name. The artist went on to enjoy an international career, notable exhibitions include 1954 at Sarrebruck, Germany; 1956 Metz, France; 1957 Strasbourg; 1958 Galerie Bernheim, Paris; 1964 Galerie Henquez; 1970 Musée Rodin, Paris; 1987 Fine Art Society, Los Angeles; 1990 Ato Gallery,Tokyo; 1995 Soufer Gallery, New York. He has also been honoured with several major awards including in 1965 the Prix d’Honneur de la Sculpture; 1972 Médaillé de la Ville de Paris; 1991 Grand Prix d’Européen de la Sculpture. In 2000 a permanent exhibition of his work was opened at the Musée de Vaz-Obervaz, in Switzerland. The artist’s work is represented in various museums of Modern Art including the Musée d’Art Moderne, Paris.